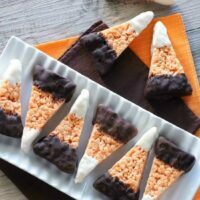 Chocolate Dipped Candy Corn Rice Krispie Treats - Dessert Now, Dinner Later! 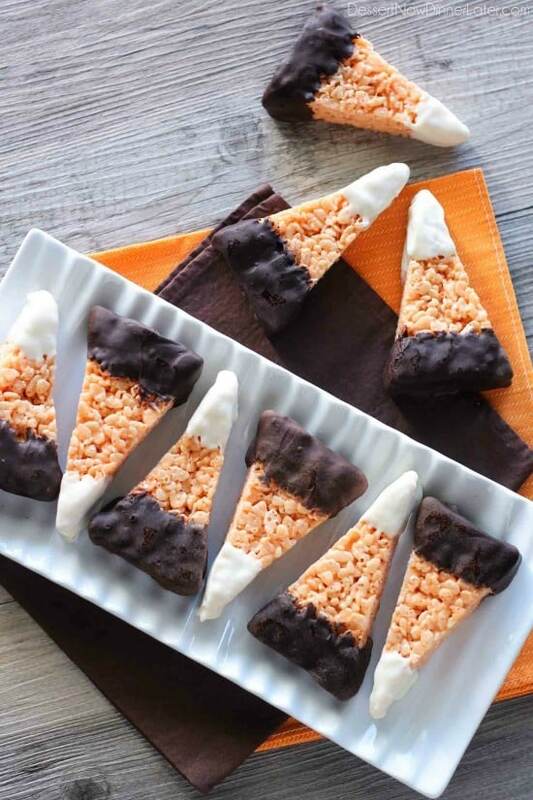 Chocolate Dipped Candy Corn Rice Krispie Treats are a fun and easy Halloween treat that the whole family will enjoy! It’s that time of year again y’all! 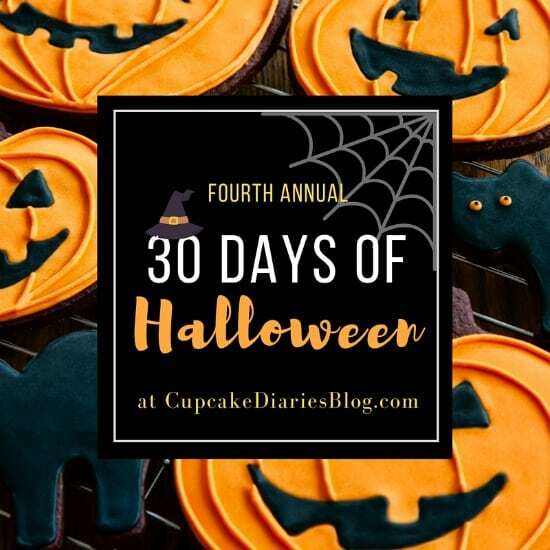 When I participate in the 30 days of Halloween series that my friend Allison hosts on her blog, Cupcake Diaries. 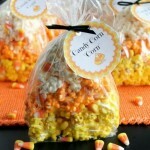 Year 1 – I made these Candy Corn Popcorn Treats that are so fun for a party. 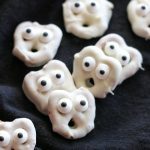 Year 3 – I got distracted from candy corn and made Mini Mummy Pizzas which are perfect to make for a quick dinner before trick-or-treating. 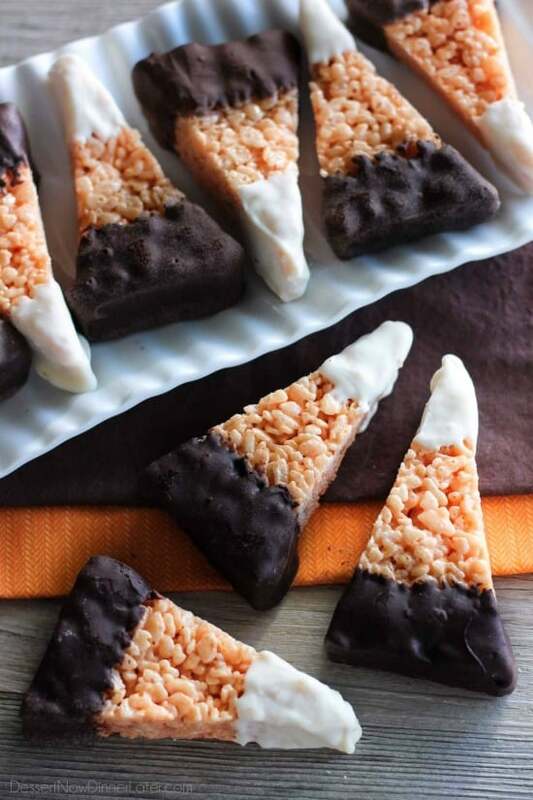 This year I’m going back to my love for all things triangular that look like candy-corn, and made these chocolate dipped rice krispie treats. But don’t ask me to eat real candy corn, because I don’t like it, HA! 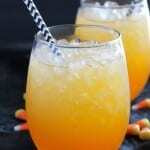 These candy corn rice krispie treats are so easy you guys! 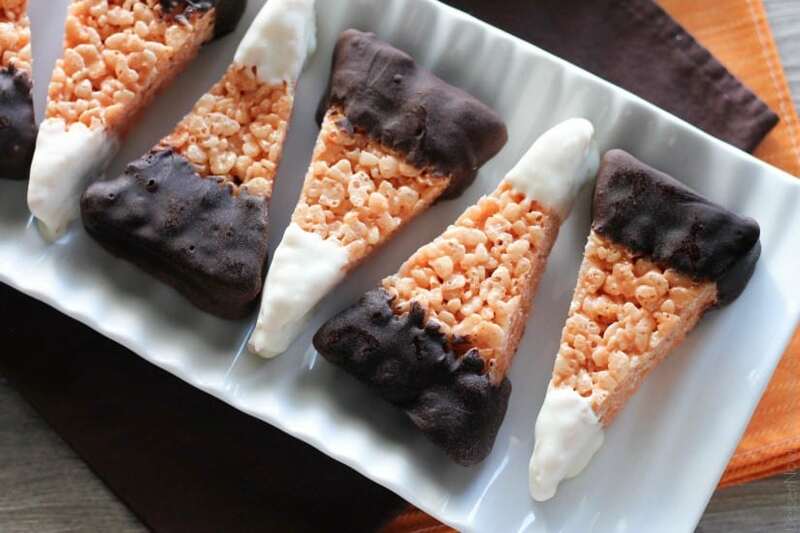 All you have to do is make your favorite rice krispie treat recipe (mine has extra mallows and vanilla extract), color it orange, then melt some dark and white chocolate chips to dip the ends in. It’s easy, and the chocolate tastes so good with the chewy rice krispie treats! I have neighbors who absolutely LOVE Halloween, so I brought these candy corn rice krispie treats to them in August, when I made them. They didn’t care that Halloween was well over two months away! Haha. It made them so happy! Imagine how happy they will be when I make them again for Halloween. 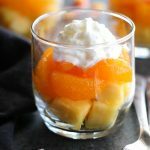 😉 These candy corn rice krispie treats are great for adults and kids alike. Enjoy! Spray a 9x13-inch baking dish with cooking spray. Set aside. In a large stock pot, melt the butter with the vanilla over medium heat. Add the mini marshmallows and food coloring. Stir until marshmallows are completely melted, adjusting the color as needed. Remove from heat. Add the Rice Krispies Cereal. Fold gently until evenly coated. Spread into the prepared baking dish and flatten evenly. Allow to cool completely. Place half of the bag (1 cup) of semi-sweet chocolate chips into a bowl. Add ½ tsp coconut oil or shortening (optional--helps to thin the chocolate). Microwave in short 15 second bursts, stirring in-between, until completely melted. Dip the fat end of each triangle ⅓ of the way up, scrape off excess chocolate and lay on a tray with wax/parchment paper or a silicone baking mat. (You will need two trays.) Heat the remaining chocolate chips with ½ tsp coconut oil or shortening (optional) in 15 second bursts, until melted, when needed. Dip all triangles until complete. Place the trays in the freezer for 10 minutes or so, to solidify the chocolate. Melt 1 cup (1/2 bag) white chocolate chips with ½ tsp coconut oil or shortening (optional) in a bowl in the microwave for 15 second bursts, stirring in-between, until completely melted. Dip the top ⅓ of each triangle in the melted white chocolate. Scrape off excess chocolate and place back onto tray. Repeat with each triangle. * I highly recommend Guittard baking chips. They taste better and work great.